"Jordan's weird western snatches the best adventure and suspense elements from both genres and distills them to their essences, creating a violence-laced but enjoyable romp." "This first novel adds a fresh sf twist to a coming-of-age tale of a Wild West legend. Told from Calamity Jane's point of view, this gritty story blends the right amount of hard trials and humor, giving readers a revitalized perspective on a familiar folklore heroine." 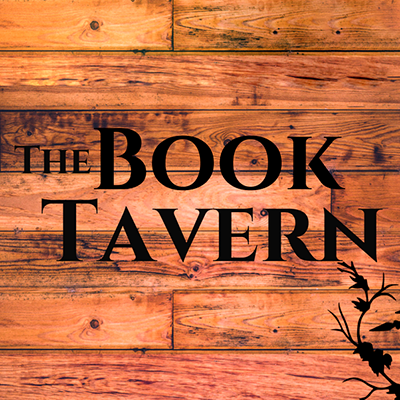 Chosen as a Nook Press Presents selection for October-November 2016. 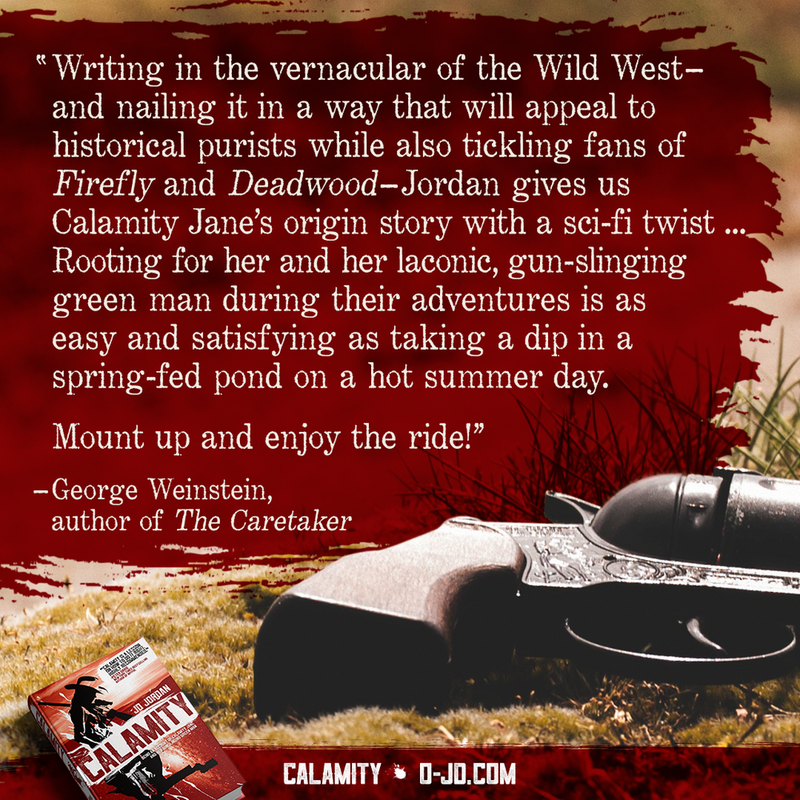 "JD Jordan's Calamity is a satisfyingly gritty, intense and entertaining novel that deserves the attention of speculative fiction readers ... It's something different, because it offers a fascinating glimpse into the early life of Calamity Jane. 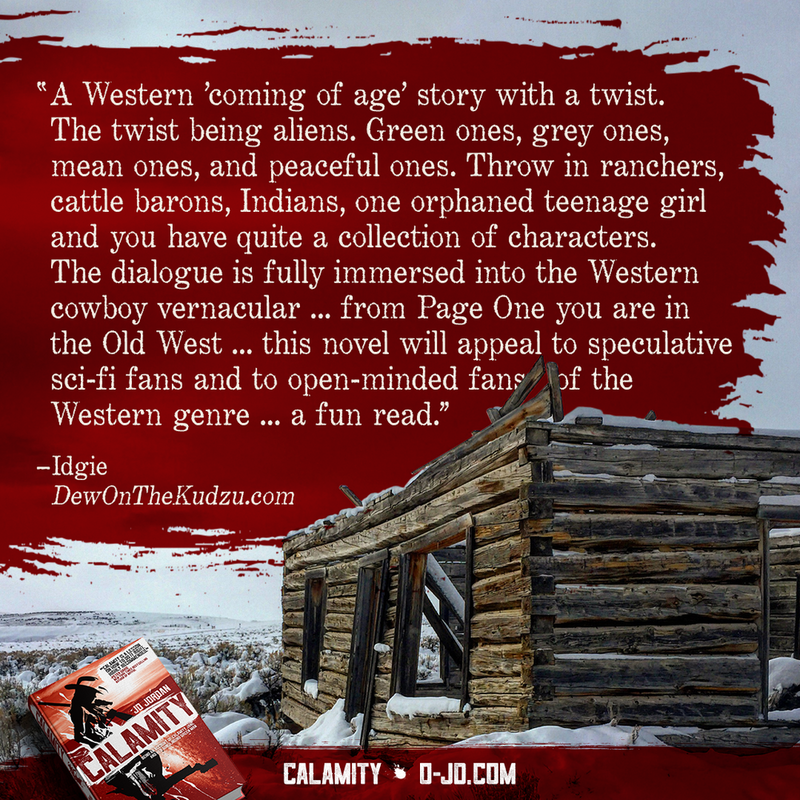 It's quite an extraordinary sci-fi Western romp." 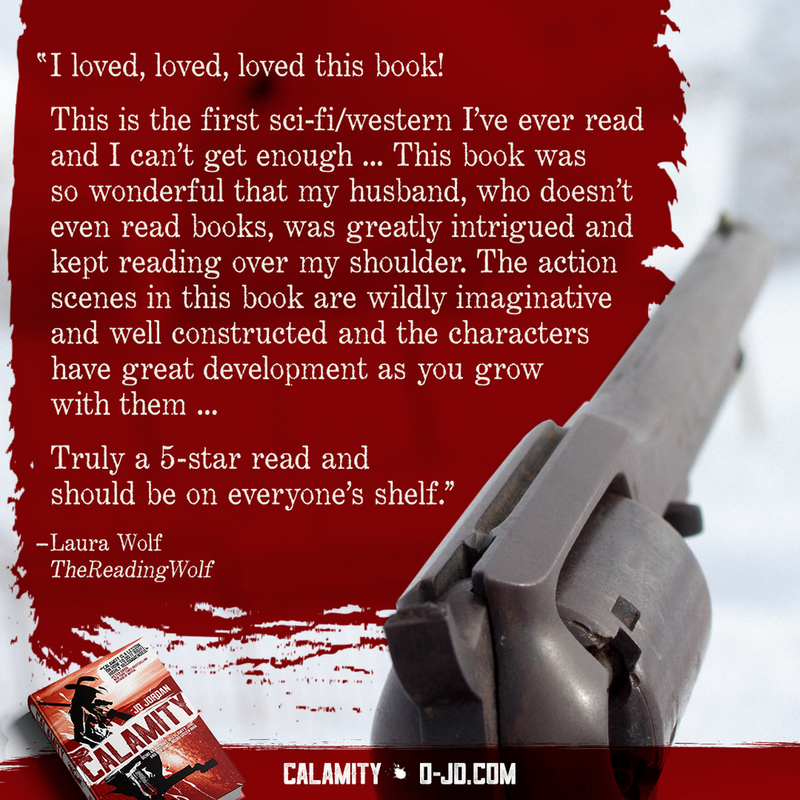 "Calamity has to be one of the most original books I have ever read." 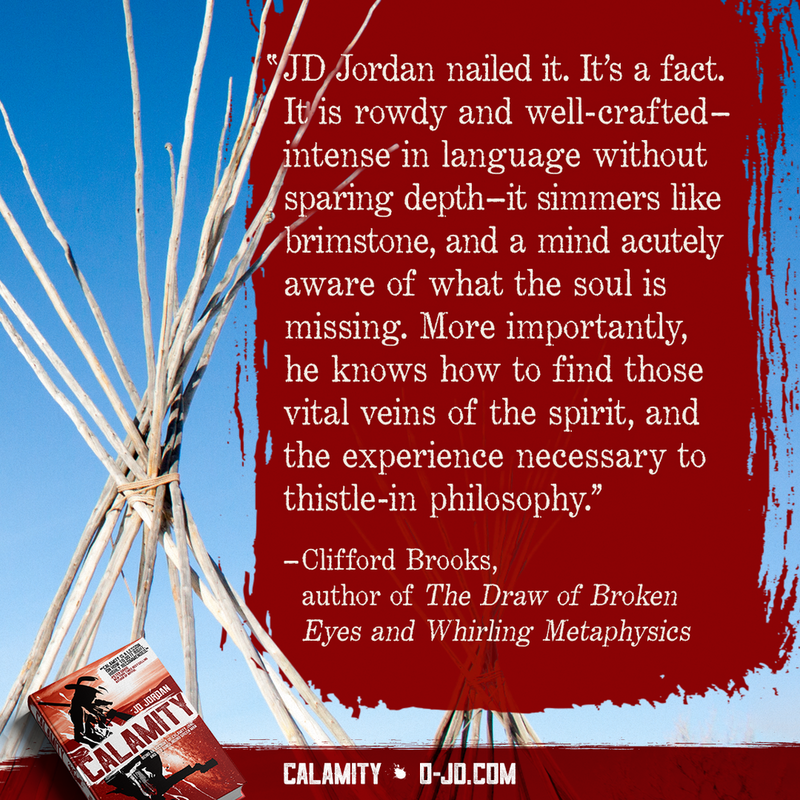 "Calimity is far and away the most creative work of fiction I have read in years. It is incredibly imagined, beautifully rendered, and hauntingly real. 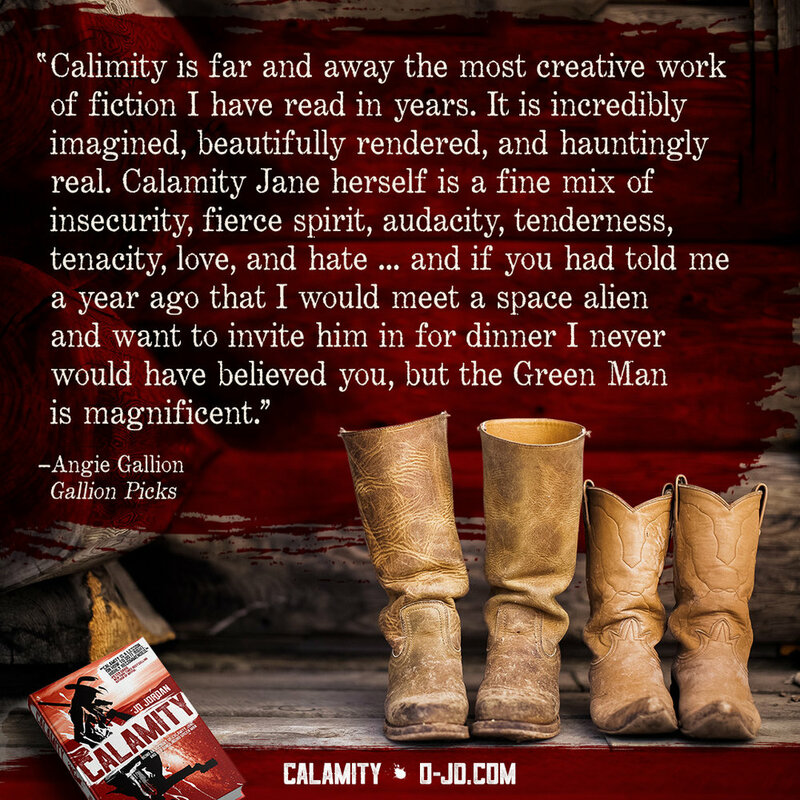 Calamity Jane herself is a fine mix of insecurity, fierce spirit, audacity, tenderness, tenacity, love, and hate ... and if you had told me a year ago that I would meet a space alien and want to invite him in for dinner I never would have believed you, but the Green Man is magnificent ... JD Jordan has done everything right in this debut novel. It is fast paced and immensely creative ... Jordan has a new fan in me, that's for sure. I don't care what the subject of his next book is, I'll be reading it." "Not my typical genre (or mix of genres) but there was something so fresh and sharp about this one; at times I was in stitches from laughing so hard and at others I was captured by the action. Highly recommended for those looking for something new and unique, especially if you are looking to broaden your genre selection and expose yourself to something that might not cross your radar otherwise." "A Western 'coming of age' story with a twist. The twist being aliens. Green ones, grey ones, mean ones, and peaceful ones. Throw in ranchers, cattle barons, Indians, one orphaned teenage girl and you have quite a collection of characters. The dialogue is fully immersed into the Western cowboy vernacular ... from Page One you are in the Old West ... this novel will appeal to speculative Sci-Fi fans and to the more open-minded fans of the Western genre ... a fun read." 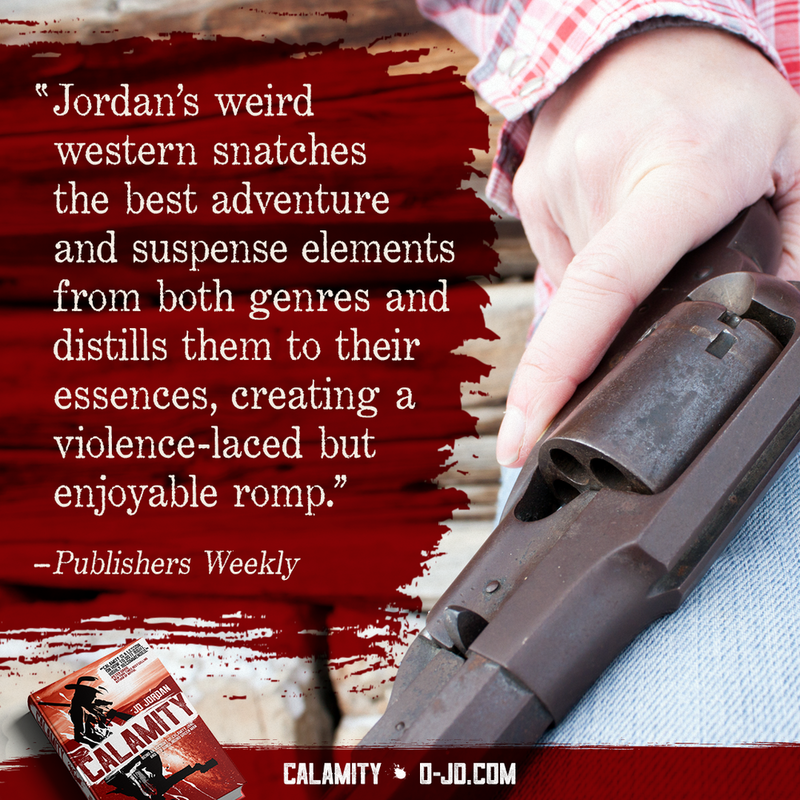 "Calamity by J.D. Jordan, a western with some real twists. It's not your Daddy's version of the story of Calamity Jane but it's a good one." "I loved, loved, loved this book! This is the first sci-fi/western I’ve ever read and I can’t get enough ... This book was so wonderful that my husband, who doesn’t even read books, was greatly intrigued and kept reading over my shoulder. The action scenes in this book are wildly imaginative and well constructed [and] the characters have great development as you grow with them ... Truly a 5-star read and should be on everyone’s shelf." "This is a rare one. The mix of Sci-Fi and Western reminds me of a cult classics like Firefly, but with Jordan’s own unique twist on the mashed up genre. He pulls you along with the characters and story, and we get to play in his sandbox. Check it out, and then go pester JD to write the next one ASAP." 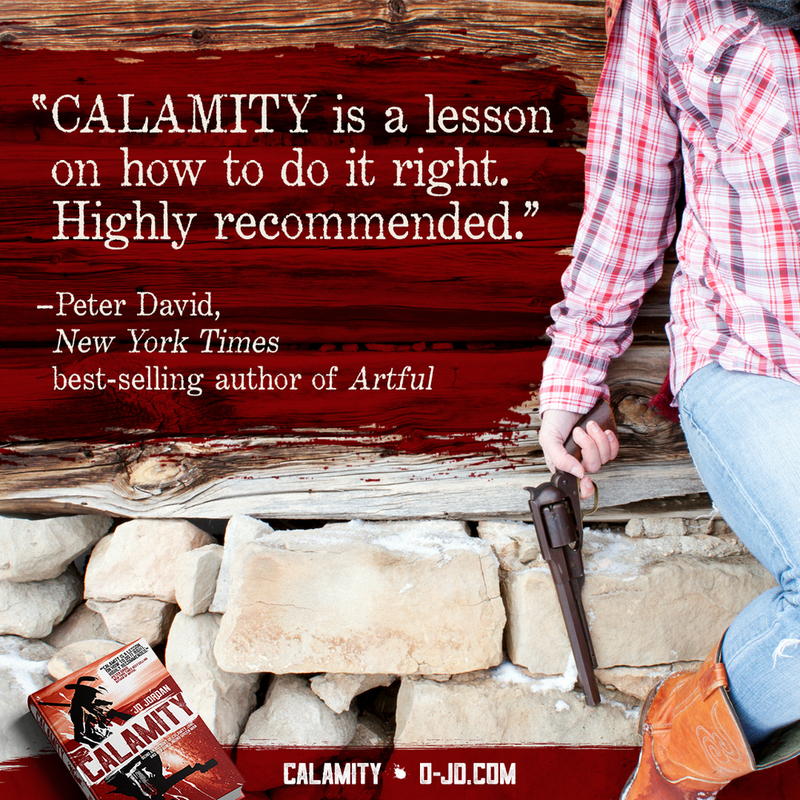 "Calamity is a lesson on how to do it right. Highly recommended." "Writing in the vernacular of the Wild West—and nailing it in a way that will appeal to historical purists while also tickling fans of Firefly and Deadwood—Jordan gives us Calamity Jane's origin story with a sci-fi twist ... Rooting for her and her laconic, gun-slinging green man during their adventures is as easy and satisfying as taking a dip in a spring-fed pond on a hot summer day. Mount up and enjoy the ride!" "A brilliantly imagined adventure crossed with a story of trust and faith and all the things of the universe we think we understand but don't—there's action and humor and pathos ... so much heart in these pages. Do not miss this jewel of a book." "It's like Quentin Tarantino wrote a feminist western memoir. With aliens." "JD Jordan nailed it. It's a fact. It is rowdy and well-crafted—intense in language without sparing depth—it simmers like brimstone, and a mind acutely aware of what the soul is missing. More importantly, he knows how to find those vital veins of the spirit, and the experience necessary to thistle-in philosophy." 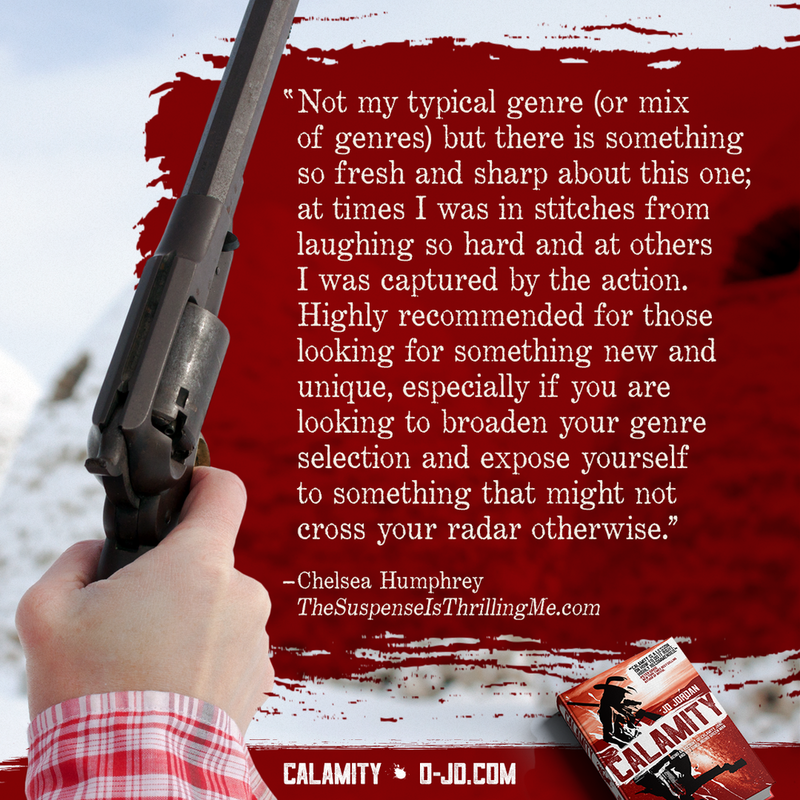 As part of an online Twitch stream roundtable on Joshua Robertson’s Writer Imperfect, JD talked about Calamity’s inspiration, research, and cover design. A killer review that grades Calamity against 5 unique reader metrics—and offers a bourbon pairing, matching Calamity Jane and her Green Man with Yipee Ki-Yay from High West Distillery. A panel of five writers having an extended conversation about “What's Really Wise in Conventional Writing Wisdom,” with advice gleaned from years of experience. Their lessons apply to new writers and multi-book authors alike. All the great #Calamitynovelreviews FROM INSTAGRAM.